A smart key battery should last for several years, but if the smart key is not working properly, try replacing the battery with a new one. 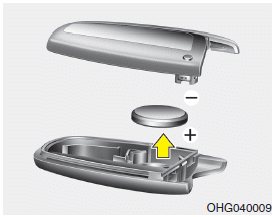 If you are unsure how to use your smart key or replace the battery, contact an authorized HYUNDAI dealer. 1. Remove the mechanical key. 2. Pry open the rear cover. 3. Replace the battery with a new battery (CR2032). When replacing the battery, make sure the battery position. 4. Install the battery in the reverse order of removal. The smart key is designed to give you years of trouble-free use, however it can malfunction if exposed to moisture or static electricity. If you are unsure how to use or replace the battery, contact an authorized HYUNDAI dealer. Using the wrong battery can cause the smart key to malfunction. Be sure to use the correct battery. To avoid damaging the smart key, don't drop it, get it wet, or expose it to heat or sunlight. Do not drop, get wet or expose the smart key to heat or sunlight, or it will be damaged.